It is worth remembering before we start this section that according to the survey records, in 2010 and 2011 more than 7.5% of businesses that responded to the Wet Leisure Survey reported that they had found business ‘extremely difficult’. This year, and last year, no businesses described their year in that way. On the following scale, how did you find business conditions this year? For 98% of the survey sample, business was ‘OK’, ‘Good’ or ‘Extremely Good’. That’s 10% up on 2015 and 2014. An impressive 42% up compared to 2012. Let’s quickly look at that in terms of the UK economy as a whole. The economy has grown during the year more strongly than the experts predicted. Unemployment has fallen and real earnings growth has risen faster than inflation. The FTSE 100 closed at a record high at the end of 2016, up 14.4% over the course of the year. Of course, there is Brexit. Since the start of the year, fears over Brexit caused the Pound to fall and since the 24th June vote, the Pound has fallen even more. That falling exchange rate will affect the UK economy and the wet leisure industry, but it doesn’t look as if it has done so yet. Our industry is usually far more concerned about the actual climate than the economic one, but not this year. What would you say were the things that had the biggest influence on your business this year? When this survey began in 2011 there was an implication that by ‘biggest influence’ we meant ‘negative impact’ and indeed a number of respondents to this year’s survey were at pains to point out that the economy and the weather had been a positive influence on their business this year. The economy we have already discussed, the summer weather in 2016 was equally sunny. It was the second warmest summer, after 2013, since 2006. And then we come to the Internet. Wet leisure businesses that are involved in e-commerce complain about competition that has cut their margins down to practically nil. Wet leisure businesses not selling online protest that they simply can’t compete with the low prices that Internet retailers offer. To be fair, this scenario is one that is being played out in a number of industries, most notably fashion and home electronics. It’s an issue that isn’t going to go away anytime soon but where the balance eventually comes to lie between e-commerce and traditional selling will be down to market forces and consumer behaviour. On the following scale, how do you expect business conditions to be next year? Over the course of the survey we have seen that the wet leisure industry, if they have had a good year this year, expects next year to be as good if not a bit better. The thing most likely to be influencing their expectations is Brexit and in particular the falling Pound. The price of imports has risen due to weakness in Sterling and that rise is expected to continue for some time. Those rising prices will have a negative impact on business. They will both have to be passed on to the customer making a sale just that bit harder or they will be absorbed by the business and reduce margin. Most businesses will probably blend the two options. It just remains to be seen the scale of that impact on the wet leisure industry as a whole. During 2016, how many of the following products did you install? Last year’s survey sample reported a total number of 2,113 spa sales. This year a slightly larger sample reported sales of 3,446. That is an increase of over 40%. That does sound like a lot, but as we have seen, the wet leisure industry has had a good year. The middle of the market has seen strongest growth – in comparison to top-end or budget – and spas and hot tubs have seen increasing and more favourable media coverage over the last couple of years. What the above graph shows is the average numbers of sales per responses so across the whole survey sample there were 12 above ground pools reported – compared to 18 last year – but the average figure is less than one so it doesn’t show on the graph. However you look at it, the traditional above ground pool is becoming a very small sector of the industry. 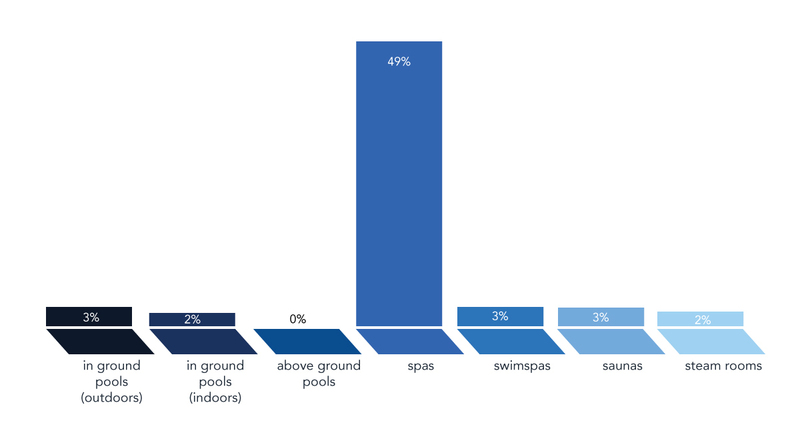 When we look at in-ground pools, we can clearly see that indoor and outdoor installations are running neck and neck. Swimspas, sauna and steam have remained fairly static compared to last year’s results.